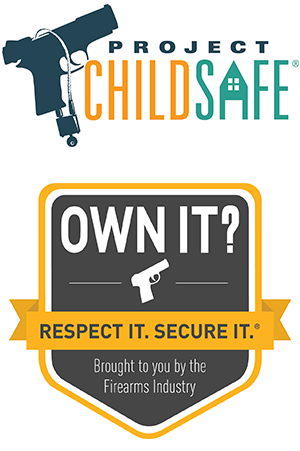 2019 marks the 20th year for NSSF's initiative Project Childsafe, a program designed to help prevent firearms accidents, theft, and misuse. While we may all disagree from time to time about the best methods to do certain things within our industry, hopefully we all agree on one thing: We don't want our guns to fall into the wrong hands, whether those hands belong to little kids or criminals. Beginning in 1999 and partnering with more than 15,000 law enforcement agencies and almost 9,000 gun ranges and retailers, Project Childsafe has handed out more than 38 million free safety kits. These firearms safety kits include a gun lock and brochure teaching gun owners how to safely store their firearms when not in use, thus keeping them out of a child's hands. Nearly 9,000 retailers, gun ranges, makers of accessories and conservation groups, along with many of the nation’s largest firearms manufacturers, have joined us in spreading the message of ‘Own It? Respect It. Secure It,’ and encouraging gun owners to store their firearms responsibly when not in use. With new companies in our industry adding their support for Project ChildSafe, I know we can continue to reduce firearms accidents, thefts and misuse, including suicide. In those 20 years there has been a noticeable downward trend in the number of fatal firearms accidents in all age groups. They are at historic lows according to the National Safety Council (mentioned in press release without citation given). Furthermore, the press release states that the Government Accountability Office in 2017 issued a report stating that giving gun owners these free gun locks ends up in more gun owners choosing to use them and store their guns more securely. The firearms industry is committed to the safe, legal and responsible use of firearms, and, as an industry, we are the leading voice in the national conversation to promote responsible actions among legal gun owners, to help prevent accidents and to help keep guns out of the wrong hands. Because all those actions are real solutions that make homes, neighborhoods and communities safer. If you want to learn more about the NSSF's Project Childsafe program, you can visit their page here. And, if you'd like to see more conversation about a similar topic, visit our page titled: Keeping A Gun On The Nightstand, written by our president Jacob Paulsen. By my last check it had over 280 comments on it, and some of them are golden. I also grew up with a father that showed me proper gun handling, control and safety. I was my dads rabbit dog at the age of 4 years old walking behind him and yes learning how to duck tree limbs at a early age after following to closely and getting hit by a few in the faces. Learning how to kick brush piles and fence rows. Then at the age of 7 shooting his 22cal browning rifle. Then of course my first age of hunting was the age of 12. Started out hunting squirrel, with a side by side 410 Steven’s shot gun that belonged to my Grandma. Dad purchased me a 12 gauge Russian side by side double barrel shot gun I was 13 years old when I started deer hunting and I hunted with that 12 gauge gun into my 30’s I loved it. Great memories and fun.